Morro Bay is brimming with wildlife. From sea stars beneath the bay’s surface, to falcons flying overhead at the Rock, it is a great place to safely get a look at a variety of plants and animals without needing binoculars. A particular staple of our oceanside community, and the most photographed residents in Morro Bay, are the California sea otters. The otters are an important part of the Morro Bay ecosystem, playing a crucial role in keeping the estuary’s sea grass healthy. But these furry creatures are also just cute to watch grooming, sleeping, and hunting their day away. And now they’re famous – recently making international news. To see the Morro Bay otters for yourself, check out one, or all, or their favorite hangout spots below. 1. South T-Pier Just south of Great American Fish Company is a little T-shaped pier perfect for bay watching and otter spotting. Our otters love to congregate around this pier in search of food along the bay’s floor. Bring your camera, you will regret it if you don’t! Be sure to #MorroBay all your photos, we would love to see or repost them. 2. Harbor Walk Across the street from the tall smoke stacks is the start of Morro Bay’s harbor walk. This pathway circumnavigates the water’s edge and is friendly to bikes, strollers, walkers, joggers and pups. The otters love to swim alongside the pathway making for a delightful treat along your excursion. The pathway leads to Morro Rock’s parking lot. 3. Target Rock This is the locals’ name for a giant rock that sits at the entrance to Morro Rock’s parking lot. If you’re near the Rock, you will likely see otters swimming in the bay below target rock. Be sure you are looking toward the bay. 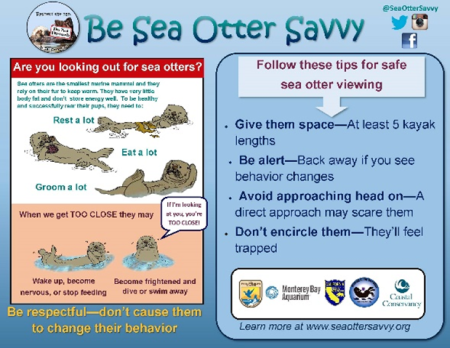 You won’t see otters if you’re looking at the ocean waves on the other side of the lot. 4. On the water Perhaps the most special way to see our otters is by kayak, boat, canoe, paddleboard or even swimming! Be sure to keep a safe distance. If they notice you, you’re too close! There are several locations to rent out a vessel for the afternoon. 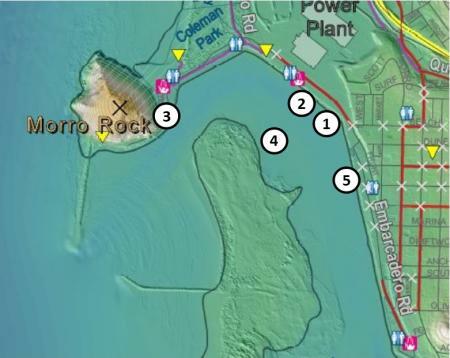 Check out http://www.morrobay.org/things-to-do/outdoors to find a rental store. 5. From your dinner table at one of our many waterfront restaurants Strategically equipped with floor-length windows and patio tables, many of the restaurants along the Embarcadero are great locations to spot otters swimming in the bay. Expect an evening of serendipity, as you will see more than sea otters in the water. 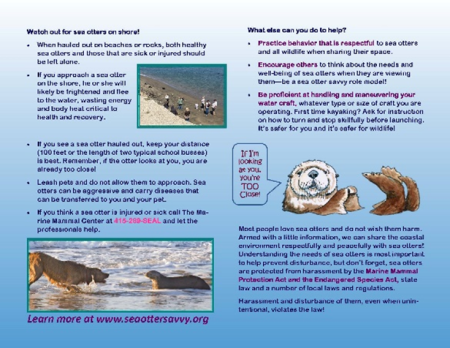 And to learn more about our otters, or to test your current knowledge, take the Sea Otter Quiz from the Morro Bay National Estuary Program.